The intersection of two to three barrel vaults produces a rib vault or ribbed vault when they are edged with an armature of piped masonry often carved in decorative patterns; compare groin vault, an older form of vault construction. While the mechanics of the weight of a groin vault and its transmission outwards to the supporting pillars remained as it had been, the new use of rib vaults demonstrates the skill of the masons and the grandeur of the new ideas circulating at the introduction of Islamic architecture in the eight century, and then adopted in Gothic architecture from the end of the eleventh century. This technique was new in the late eleventh century, for example in the roofs of the choir side-aisles at Durham Cathedral. Romanesque ancestors of the Gothic rib vault can be found in early Gothic constructions at Cefalù, Caen, Durham, and elsewhere. Some ribbed vaults even have six sections in each bay (for example, the sexpartite vault, formed by the intersection of three half "barrels"). These advances in vaulting allowed for the addition of windows higher up in the building's walls, in the clerestory and the triforium. Early Gothic buildings commonly display ribbed vaulting made of stone for the support of the weight of a wooden ceiling. Stone ceilings are stronger; for example, the chapter house at Southwell Minster has stone vaulting and no central pillar. Examples of cathedrals in England that incorporate early Gothic style features can be found in Salisbury, Lincoln, Southwell in Nottinghamshire, Wells, Bristol, Norwich and Worcester. Gothic style was widely used by cathedral builders and two continental examples are the cathedral at Reims (northern France) and the Sint Niklaaskerk in Ghent (Belgium). Where intersecting barrel vaults were not of the same diameter, Romanesque construction practice resulted in the twisting of the groins; their construction must at all times have been somewhat difficult, but where barrel vaulting was carried round over the choir aisle and was intersected by semicones instead of cylinders, as in St. Bartholomew's Smithfield, groining systems became more complicated; this would seem to have led to a change of system, and to the introduction of a new feature, which completely revolutionized the construction of the vault. Hitherto the intersecting features were geometrical surfaces, of which the diagonal groins were the intersections, elliptical in form, generally weak in construction and often twisting. The medieval builder reversed the process, and set up the diagonal ribs first, which were utilized as permanent centres, and on these he carried his vault or web, which henceforward took its shape from the ribs. Instead of the elliptical curve which was given by the intersection of two semicircular barrel vaults, or cylinders, he employed the semicircular arch for the diagonal ribs; this, however, raised the centre of the square bay vaulted above the level of the transverse arches and of the wall ribs, and thus gave the appearance of a dome to the vault, such as may be seen in the nave of Sant' Ambrogio, Milan. To meet this, at first the transverse and wall ribs were stilted, or the upper part of their arches was raised, as in the Abbaye-aux-Hommes at Caen, and the Abbey of Lessay, in Normandy. The problem was ultimately solved by the introduction of the pointed arch for the transverse and wall ribs - the pointed arch had long been known and employed, on account of its much greater strength and of the lessened thrust it exerted on the walls. When employed for the ribs of a vault, however narrow the span might be, by adopting a pointed arch, its summit could be made to range in height with the diagonal rib. Moreover, when utilized for the ribs of the annular vault, as in the aisle round the apsidal termination of the choir, it was not necessary that the half ribs on the outer side should be in the same plane as those of the inner side; for when the opposite ribs met in the centre of the annular vault, the thrust was equally transmitted from one to the other, and being already a broken arch the change of its direction was not noticeable. The first introduction of the pointed-arch rib took place at Durham Cathedral and pre-dated the vaulting of compartments of varying shapes seen at the Abbey of St. Denis. Whilst the pointed rib-arch is often seen as an identifier for Gothic architecture, Durham is a Romanesque cathedral whose masons experimented with the possibility of rib-arches before it was widely adopted by western church architecture. It was in the church at Vezelay (1140) that it was extended to the square bay of the porch. Before entering into the question of the web or stone shell of the vault carried on the ribs, the earlier development of the great vaults which were thrown over the naves of a cathedral, or church, before the introduction of the pointed arch rib, shall here be noted. As has been pointed out, the aisles had already in the early Christian churches been covered over with groined vaults, the only advance made in the later developments being the introduction of transverse ribs' dividing the bays into square compartments; but when in the 12th century the first attempts were made to vault over the naves, another difficulty presented itself, because the latter were twice the width of the aisles, so that it became necessary to include two bays of the aisles to form one square bay in the nave. This was an immense space to vault over, and moreover, it followed that every alternate pier served no purpose, so far as the support of the nave vault was concerned, and this would seem to have suggested an alternative, viz. to provide a supplementary rib across the church and between the transverse ribs. This resulted in what is known as a sexpartite, or six-celled vault, of which one of the earliest examples is found in the Abbaye-aux-Hommes (S. Etienne) at Caen. This church, built by William the Conqueror, was originally constructed to carry a timber roof only, but nearly a century later the upper part of the nave walls were partly rebuilt, in order that it might be covered with a vault. The immense size, however, of the square vault over the nave necessitated some additional support, so that an intermediate rib was thrown across the church, dividing the square compartment into six cells, and called the sexpartite vault; this was adopted in the cathedrals of Sens (1170), Laon (1195), Noyon (1190), Paris (1223–35), and Bourges (1250). The intermediate rib, however, had the disadvantage of partially obscuring one side of the clerestory windows, and it threw unequal weights on the alternate piers, so that in the cathedral of Soissons (1205) a quadripartite (fig. 8) or four-celled vault was introduced, the width of each bay being half the span of the nave, and corresponding therefore with the aisle piers. To this there are some exceptions, in Sant' Ambrogio, Milan, and San Michele, Pavia (the original vault), and in the cathedrals of Spires, Mainz and Worms, where the quadripartite vaults are nearly square, the intermediate piers of the aisles being of much smaller dimensions. In England sexpartite vaults exist at Canterbury (1175) (set out by William of Sens), Rochester (1200), Lincoln (1215), Durham (east transept), and St. Faith's chapel, Westminster Abbey. In the earlier stage of rib vaulting, the arched ribs consisted of independent or separate voussoirs down to the springing; the difficulty, however, of working the ribs separately led to two other important changes: (I) the lower part of the transverse diagonal and wall ribs were all worked out of one stone; and (2) the lower horizontal, constituting what is known as the tas-de-charge or solid springer. Fig. 9 is a diagram made by Professor Willis taken from the south transept of Westminster Abbey. The horizontal courses rise to N. or about half the height of the vault, but the ribs are freed from one another from the point M. The tas-de-charge, or solid springer, had two advantages: (1) it enabled the stone courses to run straight through the wall, so as to bond the whole together much better; and (2) it lessened the span of the vault, which then required a centering of smaller dimensions. As soon as the ribs were completed, the web or stone shell of the vault was laid on them. In some English work, as may be seen in fig. 9, each course of stone was of uniform height from one side to the other; but, as the diagonal rib was longer than either the transverse or wall rib, the courses dipped towards the former, and at the apex of the vault were cut to fit one another. At an early period, in consequence of the great span of the vault and the very slight rise or curvature of the web, it was thought better to simplify the construction of the web by introducing intermediate ribs between the wall rib and the diagonal rib and between the diagonal and the transverse ribs; and in order to meet the thrust of these intermediate ribs a ridge rib was required, and the prolongation of this rib to the wall rib hid the junction of the web at the summit, which was not always very sightly, and constituted the ridge rib. In France, on the other hand, the web courses were always laid horizontally, and they are therefore of unequal height, increasing towards the diagonal rib. Each course also was given a slight rise in the centre, so as to increase its strength; this enabled the French masons to dispense with the intermediate rib, which was not introduced by them until the 15th century, and then more as a decorative than a constructive feature, as the domical form given to the French web rendered unnecessary the ridge rib, which, with some few exceptions, exists only in England. In both English and French vaulting centering was rarely required for the building of the web, a template (Fr. cerce) being employed to support the stones of each ring until it was complete. In Italy, Germany and Spain the French method of building the web was adopted, with horizontal courses and a domical form. Sometimes, in the case of comparatively narrow compartments, and more especially in clerestories, the wall rib was stilted, and this caused a peculiar twisting of the web, as may be seen in fig. 9, where the springing of the wall rib is at K: to these twisted surfaces the term ploughshare vaulting is given. One of the earliest examples of the introduction of the intermediate rib is found in the nave of Lincoln Cathedral, and there the ridge rib is not carried to the wall rib. 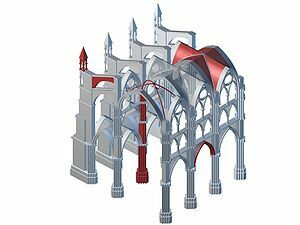 It was soon found, however, that the construction of the web was much facilitated by additional ribs, and consequently there was a tendency to increase their number, so that in the nave of Exeter Cathedral three intermediate ribs were provided between the wall rib and the diagonal rib. In order to mask the junction of the various ribs, their intersections were ornamented with richly carved bosses, and this practice increased on the introduction of another short rib, known as the lierne, a term in France given to the ridge rib. English Lierne vaulting uses short ribs that cross between the main ones; these were employed chiefly as decorative features, for example in stellar vaults, one of the best examples of which is in the vault of the oriel window of Crosby Hall, London. The tendency to increase the number of ribs led to singular results in some cases, as in the choir of Gloucester Cathedral where the ordinary diagonal ribs become mere ornamental mouldings on the surface of an intersected pointed barrel vault, and again in the cloisters, where the introduction of the fan vault, forming a concave-sided conoid, returned to the principles of the Roman geometrical vault. This is further shown in the construction of these fan vaults, for although in the earliest examples each of the ribs above the tas-de-charge was an independent feature, eventually it was found easier to carve them and the web out of the solid stone, so that the rib and web were purely decorative and had no constructional or independent functions. There is more information on the rib vault at the main article for vaulting. ^ Giese-Vögeli, Francine (2007). Das islamische Rippengewölbe : Ursprung, Form, Verbreitung [Islamic rib vaults: Origins, form, spread]. Berlin: Gebr. Mann. ISBN 978-3-7861-2550-1. ^ Gardner's Art Through the Ages, (2006), Ch. 13. Gothic Art: "Architectural Basics" p. 352. Chisholm, Hugh, ed. (1911). "Rib" . Encyclopædia Britannica. 23 (11th ed.). Cambridge University Press. p. 281.